IN Chinese cuisine, lotus is a plant of many uses. Lotus seed, above all, is essential for mooncakes. Lotus root is a much loved ingredient for both sweet and savoury dishes as well as soups, while the lotus leaf lends an appetising aroma to food. Away from food, lotus is often used as a metaphor for purity and dignity as the bloom is not stained even though it grows in mud. With that in mind, Oversea Group of Restaurants has whipped up a special lotus-inspired menu to complete its fine selection of mooncakes this year. The group is also highlighting its Shanghai Mooncake said to be invented by group founder and managing director Yu Soo Chye 30 years ago when there was a sudden request from customers for mooncake. “Our restaurant did not have mooncakes then and that request was really a challenge. At that time, the pastry chef was making the Phoenix Biscuit, which was inspired by Shanghai pastries. Looking at that, I got the idea for the new mooncake. “As the dessert was inspired by Shanghainese pastries, we called it Shanghai Mooncake,” Yu said. To commemorate the occasion, the then box design featuring two astronauts who found mooncakes on the moon surface is being introduced again this year. Yu demonstrated how to make the Shanghai Mooncake, which lures with its crumbly and buttery crust. He advised that this mooncake should be reheated in the oven for three minutes before served to savour its best taste and aroma. The lotus-inspired menu starts with Mid-Autumn Treasures Platter, a tangy appetiser that combines the good tastes of lotus seed, sliced roast duck, pear, green apple, mango in Teochew plum sauce. These ingredients are mixed and savoured with warm rice crepe. Skilful: Yu making the Shanghai Mooncake with dexterity. 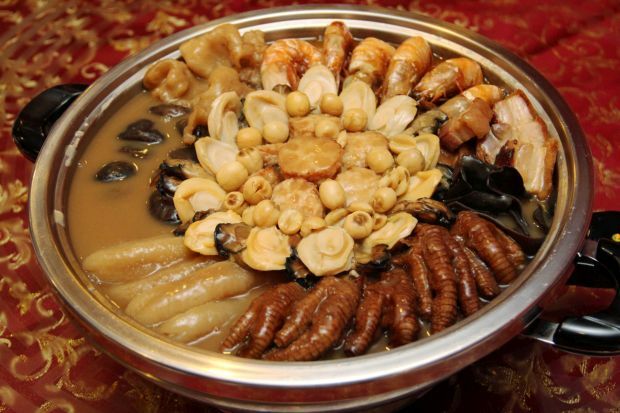 Next came the Pan Chai, a large pot of premium ingredients including abalone, sea cucumber, prawn, lotus seed and wolfberry among others. The arrangement of these ingredients when served resembles a blooming lotus. Stir-fried Lily Bulb with Lotus Root and Glutinous Rice Wrapped in Lotus Leaf are other dishes to spice up your mid-autumn experience. The group’s special mooncake creations — Golden Starlight, Snowy Noble Delight with Mango Paste and Snowy Chocolate with Coffee Paste – were served in between the dishes. Yu said the group took pride in the mooncakes’ superior quality, as each ingredient used was of the highest quality such as using only Hunan lotus seeds for the paste. The snow-skin range is special thanks to its melt-in-the-mouth texture. 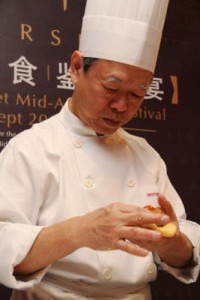 Yu said with the chefs’ mastery, the paste was fine and smooth like ice cream, therefore the mooncakes had to be kept in the freezer and when served, they should be cooled in room temperature for about 20 minutes before enjoying them. For reservations or to place an order for mooncakes, call 03-7845 9911 or visit the group’s Facebook page http://www.facebook.com/Oversea.